In many parts of Europe, within as well as outside the struggling Roman Empire, the third to fifth centuries AD were a period of crisis and de population. This was followed by a slow recovery in the following centuries. During the seventh to ninth centuries, the peripheries of Europe, Scandinavia, Ireland, Muslim Spain, and the Byzantine Empire, showed the more dynamic development. From the ninth century, the North Sea region and Central Europe recovered and went through a period of fast population growth, which led to large scale reclamations of forests, heathlands, and wetlands. Most of the extensive forests and fen lands that still existed in the beginning of the period were reclaimed a few centuries later. Many of these reclamations were almost standardized, comprising linear settlements in which each farm consisted of a single strip of land. A standard size of 14–16 ha was found in the Dutch fen lands and in other regions, giving an impression of what was seen as a standard family farm unit. 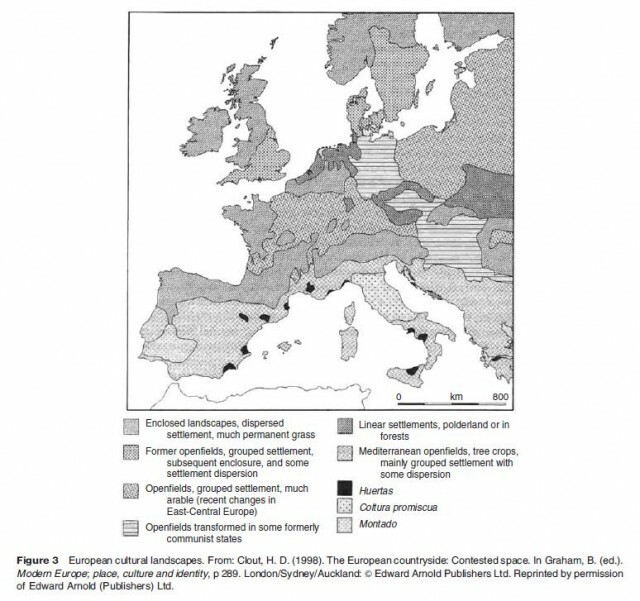 As part of the expansion, people from northwestern Europe migrated to Ireland, Spain, and Eastern Europe, especially in the last mentioned region, parts of the landscape still show the traces of planned settlements from this period. During the twelfth and thirteenth centuries, a network of towns developed and the European economic system increasingly centered around two emerging core regions, Northern Italy and Flanders, which were both characterized by a large number of towns and a very intensive agriculture. The most characteristic landscape of this period was that of the open fields, that developed from the ninth century onward. One of the results of a rising demand for food for the fast growing population was the growing emphasis on grain products, such as bread and porridge. Grain became the main staple crop and the most efficient system for producing grain consisted of open fields, large arable fields without hedges, on which the farmers from a village cooperated in a number of ways: ploughing, harvesting, management of the common lands, and using the arable as common pasture after the harvest. After a few centuries, these ‘open fields’ formed an east–west band through Europe, from central England via the Paris Basin through Central Europe, with outlying regions in southern Scandinavia and the Mediterranean – a region including the best soils of the subcontinent (Figure 3). High grain prices made subdivision of farms possible and during the early fourteenth century the fields were managed by an agrarian population that had grown immensely during the preceding centuries. Fragmentation of ownership made ever more cooperation between farmers necessary and many open fields were managed as a whole, making the villages almost being run as one large farm. When every single farmer owned a number (sometimes dozens) of parcels dispersed in the fields, the best location for the farm buildings was the village, at the center of the network of country roads. In most of the open field landscapes, villages grew into large, densely built settlements. Quite different were the much more individualized ‘enclosed’ landscapes (Figure 3) that were characterized by mixed farming with often an emphasis on pasture and a large degree of flexibility. An example was the sand belt, the zone of poor sandy soils that runs from Flanders through the Netherlands and Germany into Denmark. This zone was characterized by poor arable soils (in individual enclosures, as well as in small open fields) and more than half of the village territories consisted of common forests, heathlands, and moors. One result of large scale reclamations was the shrinking of these common lands, that were used as pastures and supplied many products such as wood, game, wool, sand, building materials, etc. and were therefore important parts of the village territories. In an agrarian economy in which risk management rather than profit maximization was the main aim for farmers, the commons could even mean survival in years of bad harvests. In many regions the population pressure of the thirteenth century led to stricter rules for the use of the commons. In parts of the sandy regions, complex systems for management of the commons developed, in which the old established farms obtained shares according to the size of their arable. Newly founded farms had less rights on the commons and their owners belonged therefore to the growing class of cottagers. What Factors Make Up Agglomeration Economies?